We make exceptional espresso and coffee, which pair well with our all-natural, local food menu featuring many gluten-free items. We offer real food for breakfast and lunch, such as homemade, made-from-scratch sandwiches, burritos, hot bagel sandwiches, and homemade soup in the winter. Our wi-fi is fast and free. Our music is custom mixed, always evolving, and really good. We can’t wait to see your smiling face in the shop! That’s right. 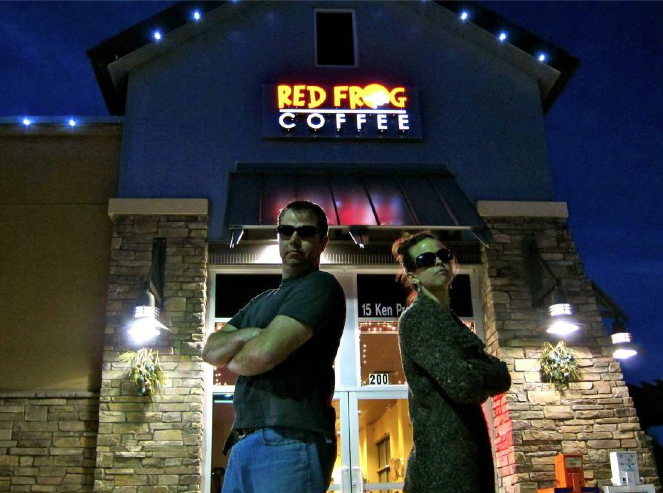 We’re Jason Kelly and Emily Kelly, the Frogster brother-and-sister team that owns this joint, Red Frog Coffee. We grew up in Allenspark, CO at an elevation of 8500 feet where the weather is cool in the summer and freezing in the winter. It’s not as cold now as it used to be when we were kids. Some blame global warming for that. Others say it’s just the natural cycle of things. Whatever it is, though, we remember growing up among eight-foot walls of snow on either side of our long road home, and the coziness the snowy winters created when we came inside from shoveling or sledding or taking care of animals. You know what we did first? Drank hot chocolate or coffee at the kitchen table. Those comforting mug drinks in our mountain home created in us a love of coffee, and we wanted to open our own shop one day to share the feeling with others. Fast forward many years. Emily learned the coffee trade by working at shops, both in Colorado and California. Jason became a writer in California and then Japan. The dream hung in there across time and distance, though, and in autumn 2009 we decided that Emily had enough talent and Jason enough money to finally stop dreaming and start doing. To find a stable, year-’round population but stay close to home, we decided the shop would do better in Longmont than in the mountains. We found everything we wanted in a former Starbucks location, and set up shop. We opened the doors in May 2010 and have enjoyed watching the business grow ever since. Our mountain roots leave us leaning toward the natural and sustainable side of life, so our coffee is free range, bicoastal, childproof, soy based, chemical free, biodegradable, ADHD neutral, non-crystallizing, interactive, recycled, on message, beta blocked, gently roasted but fast acting, unmarked, oven-ready, nurturing, double wrapped and vacuum packed to go over the rainbow in a joyful glow. Or, rather: organic, shade grown, and fair trade. More than all that, though, it’s delicious! Our menu items are local and, coincidentally, so are most of our customers! The food, drink, and people are locally sourced. You know what else? We’re not too big to fail. We didn’t go crying to Washington for a handout of your tax dollars to prop us up after we’d run our shop into the ground. We are the small business economy that politicians love to praise even as they crush it with stifling tax burdens and pass the tax revenue on to their cronies in banks and big business. Want to know how much government and bank financing we used? Zero! We’re entirely self-funded because the banks were so lily-livered even after receiving their bailout money from Washington that they wouldn’t agree to a loan for a mere 20 percent of Red Frog’s start-up budget. Even though we brought 80 percent cash to the table, the too-big-to-fail gang propped up with our tax revenue wouldn’t cover the other 20 percent needed to open the doors. 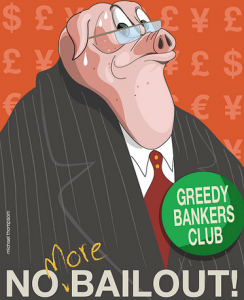 Wonder why the recession is lingering so long? Now you know. So, that’s who we are and how we got here. It might be more than you wanted to know, but we wanted you to see that there are still corners of America as independent as our forefathers envisioned, run by real people who don’t lie and cheat all day long, and neighborly enough to know you by name if you stop by on a regular basis. Too small? See us on a larger map.